Timing is everything when it comes to snagging deals, and the travel and flight booking domain is no different. 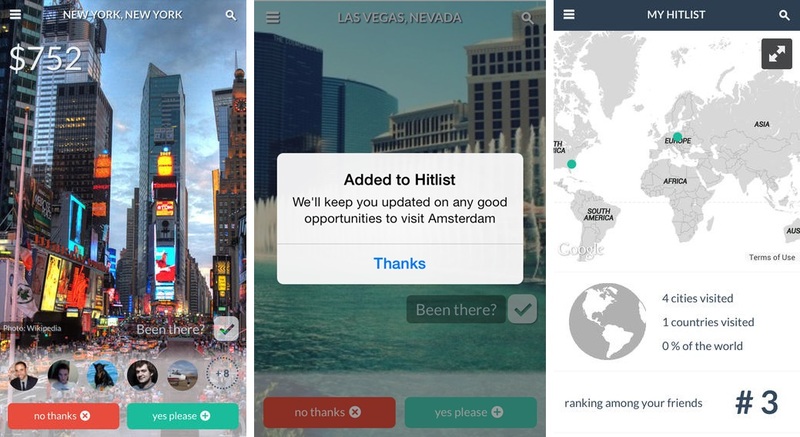 Hitlist is an app that aims to help travelers find the best deals to their favorite destinations, taking the hassle (and some of the expense) out of booking air travel. Developed by TripCommon, it is a well-designed, simple app that aims to help you complete your bucket travel list on your own financial terms. You tell Hitlist where you want to go and it keeps an eye on travel sites, letting you know when there’s a good deal to fly to any of your chosen locations. For example, I can create an alert that notifies me when (/if) flights to Amsterdam are priced at $300 or lower. Available for iOS and Android, you can sign up via Facebook — which provides data on places you and your friends have been — but you can also search for specific locations and add them to your Hitlist. The app doesn’t simply rely on your own data or intuition, it begins serving you with potential destinations right from the word go in ‘explore’ mode. You can tell the app if the place featured is somewhere you’d like to visit or not, and whether you’ve been there before. All of this helps fine tune your preferences and future suggestions. The most important components are within Hitlist’s settings menu, where you select your home airport — i.e. the one you’ll be flying from — and the price range and travel time that Hitlist will use to find your deals. The next thing we’re working on is greater latitude in customizing the deals – e.g. ‘under $200 for a weekend’ and ‘under 6 cents per mile’ for a long haul flight. We’re also planning to introduce greater search filtering, so you can prioritize ski destinations, for example. Hitlist reminds us of Flocations because it aims to make travel search a more tailored and personal experience, rather than the time-consuming and painful process that many of us suffer today. We’ll be keeping an eye on how this service develops.